I watch college football for a living, not just because I love it. That’s why I spend so many Tuesday and Wednesday nights during the fall watching two teams from the MAC go at it, and more often than not one of those teams is Northern Illinois. 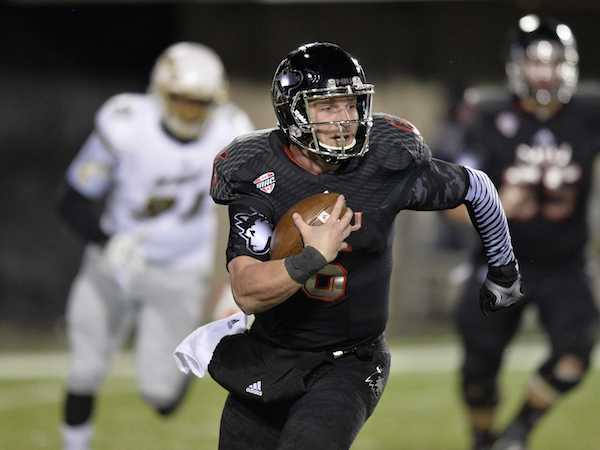 And I loved watching Jordan Lynch play quarterback for the Huskies. The kid was basically a battering ram with a football in his hands. At times he looked like a teenager trying to be tackled by a bunch of kindergarteners, dragging multiple defenders for yards at a time. It was awesome. What’s not nearly as awesome is the idea of the Bears using a draft pick on Jordan Lynch. CBS Chicago’s Adam Hoge wrote on Wednesday that the Bears will have Lynch in for a workout on April 18, and I’m hoping it’s more of a courtesy than anything else. While I loved what I saw from Lynch in college, I had no delusions about who and what he was. He’s a very good college football player, but in my opinion he just doesn’t have the skill set to cross over to the NFL. He doesn’t have the arm to make a lot of the throws he’d need to in the NFL – against NFL defenders, not MAC players. Nor is he fast enough to truly use his running ability to his advantage, and while he’s big and strong, so are most NFL defenders, so that’s somewhat of a wash. In his years at Northern, Lynch and the Huskies beat some good teams. They also beat up on a lot of bad teams. Still, the game that sticks out to me is Northern’s Orange Bowl appearance. It was the one time in Lynch’s career when he faced what closely resembles an NFL defense, as there were a lot of players on that unit who already are in the NFL or will be soon enough. After having a dominant regular season, Lynch completed only 15 of 41 passes for 176 yards, a touchdown and an interception against the Seminoles. And in case that wasn’t bad enough, while he did rush for 44 yards, he also needed 23 carries to get there. So unless Lynch is working out to replace Michael Bush, it’s not going to work. I want the Bears to use a draft pick on a quarterback this spring, but I don’t want that quarterback to be Jordan Lynch. I appreciate everything he did in college, but he’s just not going to work out as a quarterback in the NFL. I can’t see it happening. If the Bears have an opportunity to sign him as an undrafted free agent, I’d be fine with that. But draft picks are too precious to be used on lottery tickets. This entry was posted in Chicago Bears and tagged Jordan Lynch, NFL Draft by Tom Fornelli. Bookmark the permalink.